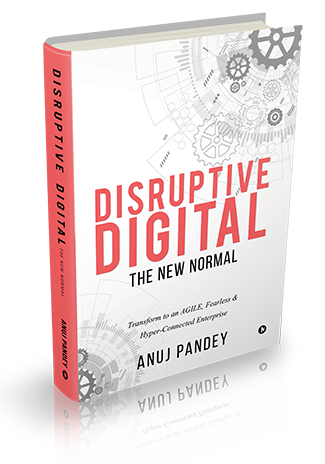 In part 1 ( click here to read part 1) of the interview, Anuj Pandey, author of the book ‘Disruptive Digital: The New Normal’ and GM – Principal Consultant, Tech Mahindra explained the digital maturity model as prescribed in his book and where different organizations, both globally and in India, stand on the maturity curve. In part 2 of the interview, Pandey offers a few suggestions and guidelines for organizations to stay ahead in the digital game and traverse the digital transformation journey more smoothly. He also answers the much touted CIO vs. CDO debate. How much of digital is technology and how much is non-technology? I believe that only 20% of digital is driven by technology. The remaining 80% is driven by business model and people, which includes organizational culture and structures. If you look at digital purely as technology centric its going to be a very myopic view. People is a very important aspect of any transformational effort in digital. Although there is lot of talk around the millennial already having the skills required for digital, those are only a small segment of the population. A large segment of the people is still not there. Within the people aspect, the organizational culture is absolutely crucial because at the end of the day operational agility cannot be attained if your organizational culture does not go through a change. The culture needs to be open and built on trust while the structures need to be flat. Considering the way digital disruption is shaping up, decisions will need to be made very quickly. However, if you follow the traditional hierarchical structures, then its going to be a big pain to actually reach decisions. Decision making has to reach the lowest common denominator because you might implement technologies but at the end of it if the lowest common denominator is not empowered to take decisions you are not going to go anywhere. What is it that companies need to do to stay ahead in the digital game? Of the total investments being made into digital transformation, almost 85% of don’t meeting the objectives. Everyone knows that they need to transform and they want to do it, but no one is clear in terms of the vision of where they really need to go and invest money in. Therefore, firstly and most importantly create a vision for yourself saying what is it that you need to do. The digital maturity model that I have prescribed in the book will be quite helpful in determining that. Considering the fast pace at which technology is changing and disrupting everything, its impossible to create a vision for 10 years down the line. You need to create a shorter cycle of vision that has to be in accordance with factors like where you stand today as against competition, how easy is it for anyone to enter your industry, how easy it is for you to influence your customers and who has control over your buyers and suppliers. Another important aspect is that the vision needs to be articulated in simple words. After the vision has been formulated and you are clear in terms of what you want to do, second step is to have a communication framework in place and ensuring that the vision percolates down to the lowest masses within the organization. The reason why a lot of transformations fail is because of lack of communication. People don’t tend to trust the leaders if the communication channels are not open. Finally, there has to be a very project centric model in which you drive the entire engagement program. In driving the program, it will be important that you track and assess your developments on a continuous basis and go for short wins. Equally important is celebrating those short wins as this instils confidence into the people. Is a CDO required to drive digital? A CDO is definitely required because that position gives digital the required focus. The CDO has to be core because a lot of times the CIOs get bogged down with too many things around the operational aspects which are not leading towards the future. There is definitely internal politics around it and a lot of apprehensions that the CDO is going to take over the control of things, which I believe is a given. To avoid any internal conflicts, the mandate for digital has to be driven top down. This initiative is so large and has such huge impact across the organization, not only for its employees but also for its customers and suppliers, that it has to be driven by the top most leader. Else it will fail to fly off and the organization will just end up sticking to a very siloed approach of doing things. Having said that, I would also like to affirm that the CDO is not the sole owner. If the assessment against the digital maturity model I have prescribed in the book shows the organization lacking on the customer engagement maturity aspect, then the CMO and CDO are required to work together to drive this engagement. On the other hand, if it is the operational agility part that requires attention, then it should be the COO, CDO and CIO coming together. Any engagement around digital has to be a collaborative effort and the CDO in isolation cannot drive digital. Having a CDO is absolutely important, but the engagement with which all these people need to come in at various stages is also critical. What would be your recommendations for organizations to survive digital disruption? My first recommendation would be to start looking at customer value from a different perspective. Value is no more related to a product as it used to be earlier, wherein it had a defined life, wherein value is created and delivered. In today’s platform driven economy, a platform has a much larger life as compared to a product. So, you need to look at value from an entire value lifecycle perspective, wherein you create value, deliver value, then re-create more value and sustain it for long. Once a value starts diminishing upon utility you have to look at creating another value. 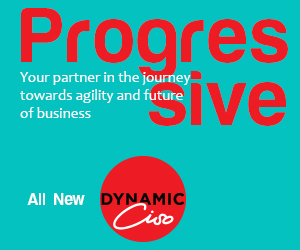 My second recommendation would be to ensure that your people, processes and technology are agile enough to be able to survive constant change that comes with digital disruption. Thirdly, its time for organizations to start looking externally as well. Till now they have been largely focused on internally – are they capable enough in terms of people, are they agile enough in terms of their processes and infrastructure, are they adaptable enough to changes which are coming up? But now, digital requires them to have exposure to and understand the external factors – how are the customers changing, how adaptable are they, how capable are the suppliers becoming?